This amazing loft is a result of work by Dethier Architectures who remodeled 154 square meter area in an old bakery using modular units that divide the space and feature various functions. 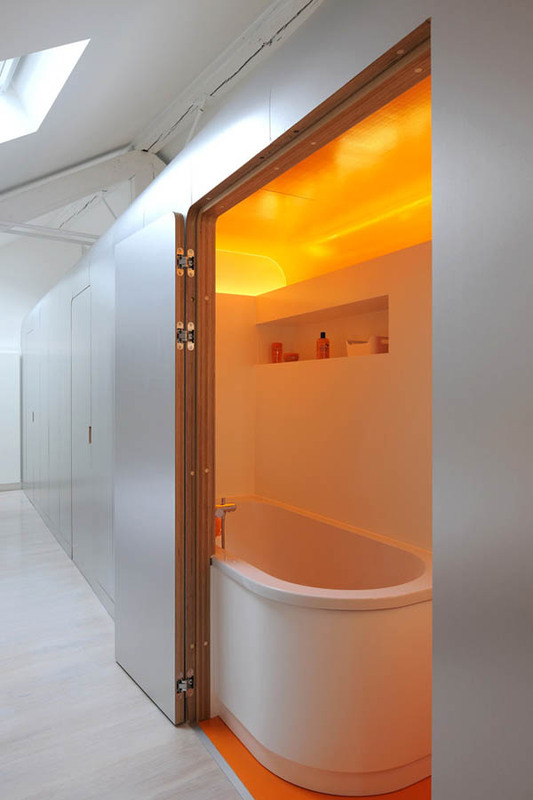 The project saw reconstruction of space to create an open layout but the individual enclosure help divide the areas inside the home for more privacy and comfort. The pod is framed with aluminum and features a rectangular shape with rounded corners and port windows that can become opaque when necessary. It includes two bathrooms (one with a shower and sink and the other one with a bathtub), a toilet and storage as well as serving as divider, keeping the bedroom separated and enclosed from the rest of the areas that include an office, hall, lounge, kitchen, and dining room. 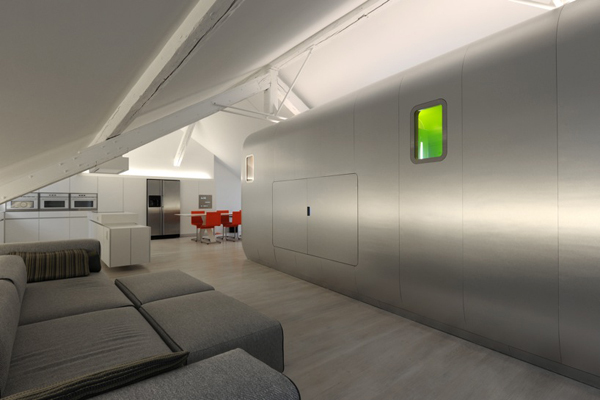 The pod also includes a TV in a side facing the living area, which makes for a great space-saving solution. 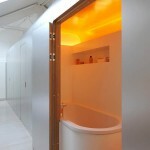 The unit especially emphasizes the futuritic style of the interior. The rest of the house is kept minimalistic in clean white color scheme with ocassional pops of bright color. The finishes are simple and include smooth light wood in flooring, which harmonizes with smooth white furnishings, and contrasts with cracked wooden beams reinforced with metal plates. Furnishings are also simple and minimalistic. 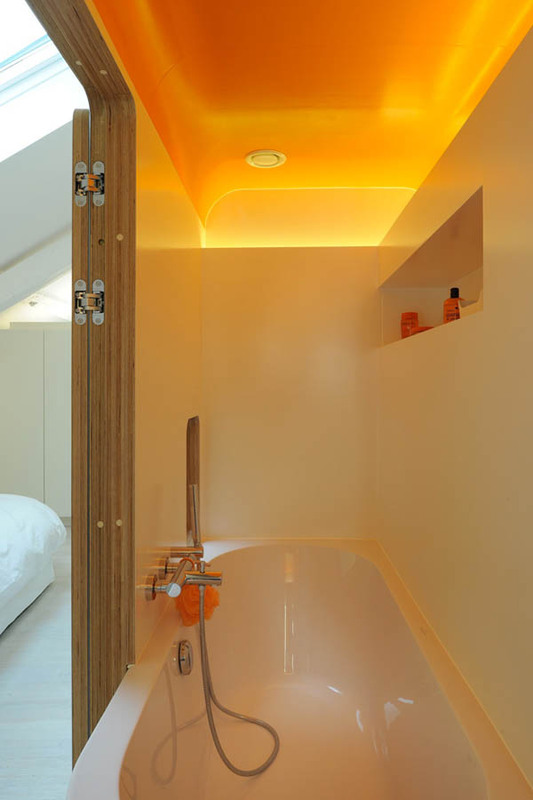 Clean lines and smooth surfaces add a lot to the rest of the picture. The loft features an outdoor area completed with a terrace and a dining set as well as some greenery and cool modern outdoor lighting. Clad in wood, the terrace makes for a cozy outdoor living space while the potted greenery provides with freshness and beauty of a garden. This loft is simply amazing. 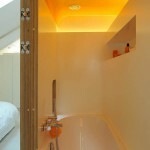 It’s not only creative but alsoo practical and features both airy feel and privacy. What do you think?